We are growing 2 cherry/grape tomatoes on our cattle panel trellis that is arching over the path between beds this summer. 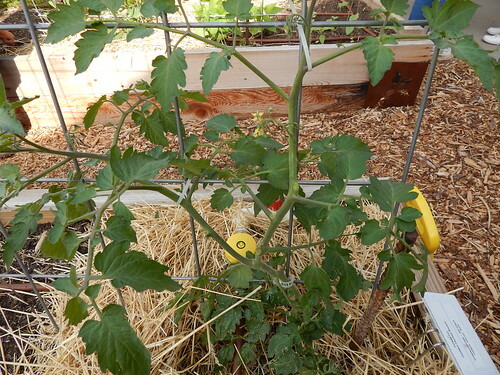 Because of the location and the fact that both tomatoes are going to be “sharing” the trellis with another vegetable (one pole bean and one cucumber), they are going to need to be managed a little more intensively than if they had the whole trellis to themselves. I’m planning to prune off all the side shoots (suckers) up to about 5 feet, and then we’ll let the plant do what it wants to for the rest of the way up the trellis. This should keep the majority of the plant from getting too busy and flopping into the walk, other plants, or just generally being where it doesn’t belong. Here’s the “after.” Can you see the difference? The main (big) difference is the large sucker that we took off. It the top picture it looks like there are 3 growing shoots, now there are only 2. We also put on some zip ties to help direct the shoots up the trellis rather than everywhere else. The last thing we did was pinch out all the small suckers that were getting started. You can prune off big suckers, but it is much better for the plant to get them when they are small. Because we are doing this heavy pruning, we probably won’t get as many early tomatoes from these plants. Oh well, we also won’t have them attacking us as we walk by either! 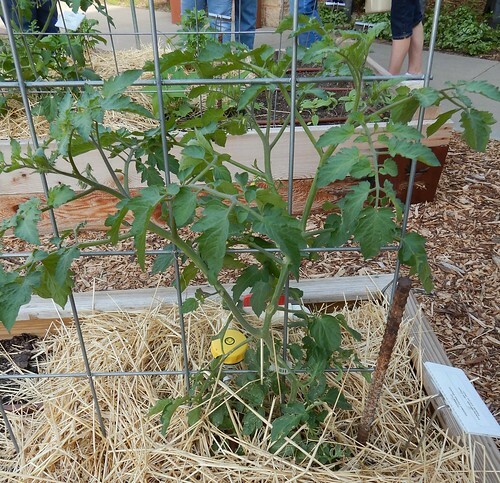 Posted on June 5, 2013, in Around the Garden and tagged pruning, Tomatoes, trellises. Bookmark the permalink. Leave a comment.